The most common hawk in the US, this large hawk is a familiar sight throughout North America and can be found in cities as well as in rural areas. Efficient hunters, they prefer to hunt from a perch and pounce on rodents and small mammals. They are best known for their red colored tails and there are numerous geographic variations in color. 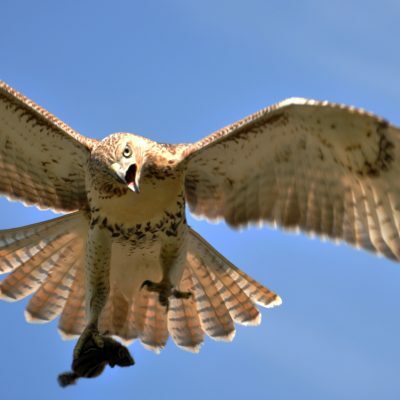 Many people are passionate about these hawks, and some of the more famous ones, like Pale Male who has taken up residence in a fashionable area of New York City, have become icons in the clash between humans and animals. They are monogamous and mate for life.